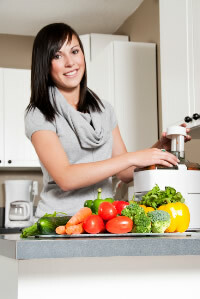 Rediscover the benefits of juicing vegetables as an adult through a raw food diet. You can't have dessert until you eat your vegetables! Many of us often heard this ultimatum at dinnertime, while we were growing up. And for that reason many of us have developed a lifelong dislike for certain veggies, with leafy greens and spinach being some of the usual suspects. However, as an adult you can rediscover vegetables through a raw food diet and the benefits of juicing vegetables. Why did we hate certain vegetables as kids? This could have been due to the preparation of the veggies. Perhaps they were canned, frozen, or overcooked. Yes, raw veggies can be an acquired taste after maintaining unhealthy diets for years. 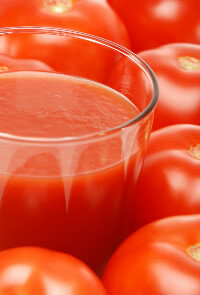 However, juicing vegetables produces a tasty and healthy drink. It’s now recommended that we consume at least five full servings of vegetables every day, but it's much more practical to juice than to eat two, three, or four pounds of veggies daily! Many of us eat the same vegetables day in and day out. Why is this a problem? We’re not getting the full spectrum of nutrients that we need to support a healthy body and mind. However, one of the benefits of juicing vegetables is that you'll have the opportunity to enjoy vegetables that typically you wouldn't consider eating raw. Why is this important? Poor diet has significantly damaged many of our digestive systems, thus making it difficult to absorb all of the vegetables nutrients. However, one of the benefits of juicing vegetables is that juicing pre-digests the vegetables for you, optimizing the amount of nutrients that your body can absorb. These substances are contained in plants and are needed for our bodies to function properly, and are very powerful in battling disease. Though you might not be motivated to eat enough veggies to get enough phytochemicals, it's much easier to juice. While your body produces certain enzymes, you also need to get enzymes from foods to aid with their complete digestion. Enter raw foods and juicing! Without enzymes, your body and brain simply wouldn't work! Vitamins, minerals, and hormones in your body would be useless! Enzymes are important for breaking down food and digesting food. Another of the benefits of juicing vegetables is that the enzymes contained in the vegetables help to improve your metabolism. In fact, certain vegetables can actually focus on certain conditions and ease or improve certain symptoms. That's because veggies in juices contain antioxidants and other substances that can boost your immune system and reduce inflammation. Since juicing removes the pulp and leaves only the easily digestible nutrients, your body doesn’t have to expend energy to breakdown and digest your food so it can put that energy towards healing. So if you’re feeling under the weather, experience the soothing benefits of juicing vegetables. Whether or not you've switched to a raw foods diet, you can certainly benefit from juicing. It's a fast, tasty, and healthy way to consume the veggies your body needs. Juice up! For further information on this exiting method of gleaning liquid nutrition from whole foods check the Frequently Asked Questions. "Enzymes are substances that make life possible. They are needed for every chemical reaction that takes place in the human body. No mineral, vitamin, or hormone can do any work without enzymes. Our bodies all our organs, tissues, and cells are run by metabolic enzymes."